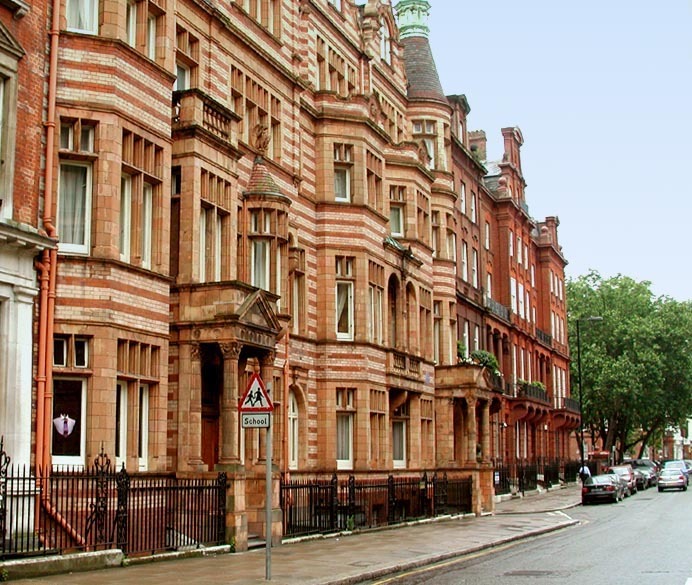 Eclectic urbanism in upper-middle-class housing, South Kensington, London. These buildings perfectly exemplify what J. Mordaunt Crook calls "the dilemma of style" in nineteenth-century architecture. In the building closest to the viewer, the architect placed a classical portico against a rogue gothic polychrome brick façade and then, for good measure, added a half of a French or German gothic turret roof over one of the bay windows. The dark red brick block of flats in the distance has an ornate Dutch revival façade, such as one sees along the old canals in Amsterdam — or George Gilbert Scott's Great Midland Hotel (1868-77), which attaches to St. Pancras Station, where it bumps up against gothic revival polychromy. Compare these blocks of flats to the stark, yet elegant simplicity of urban domestic architecture of the late eighteenth and early nineteenth centuries [GPL]. J. Mordaunt Crook, The Dilemma of Style: Architectural Ideas from the Picturesque to the Post-Modern. Chicago: University of Chicago Press, 1987.